7 months into the project and were still going strong, after completing our first water hole a short walk along the river , we have decided to begin another right in the front of the camp, this will eventually mean the further attraction of wildlife making the Legodimo camp even more of a paradise retreat. In our last update I commented on the progression of the Elephant hide we were building in the north of the reserve, since this the Elephants sadly destroyed all of our hard work, they were obviously not keen on the design or location, we are now looking at possible new areas for the hide taking into consideration the Elephant tastes. 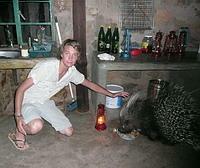 Brian the Porcupine is still up to his old tricks, he has began bringing his lady friend to the camps kitchen restaurant, all cannot wait for the eventual long line of Brian juniors, he has now become so tame we can even get down to give him a stroke, yet his demanding hunger gets out of hand when no ones home, the state of the cupboards, cooler boxes and anything else for that matter are no sight for sore eyes. A current social activity is dance classes from fellow volunteers. Surely I can't be the only one who wants to see that. Maybe Gerrit doing jazz or modern dance.priceless!!! That's it for this month, let's hope next time we can share some good news on the dreaded viewing hide.